Note: This page provides details about creating a boot diskette, or floppy disk, for Windows and not how to create a bootable CD. If you're looking for steps for newer versions of Windows (e.g., Windows 7, 8, or 10) see our how to create a recovery disk in Windows page. A boot disk allows you to boot off of a diskette instead of your hard drive. 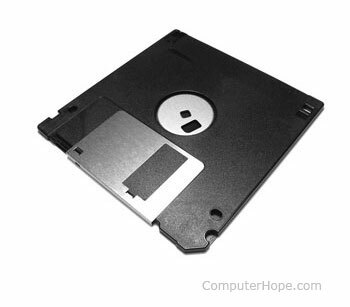 This diskette can be used to fix issues that may arise during the lifetime of your computer or help load older MS-DOS games. Keep in mind this diskette is completely different than a restore CD or disc that may have been included with your computer. Tip: After creating a boot diskette, it is highly recommended that you write-protect the diskette to prevent any virus from infecting the disk or the disk getting erased. Creating an MS-DOS boot disk. Creating a Windows 3.x boot disk. Creating a Windows 95 boot disk. Creating a Windows 98 or ME boot disk. Creating a Windows NT boot disk. Creating a Windows 2000 boot disk. Creating a Windows XP boot disk. How to use a boot disk. Note: These steps are for users who have MS-DOS installed on the computer. If you have any version of Windows follow the steps below for your version of Windows. In Windows 95, Microsoft has created a new method of creating a bootable recovery diskette. Unfortunately, however, this diskette does not support CD-ROM support and is missing a few recommended files. To do this, click Start, Settings, Control Panel, double-click the Add/Remove program's icon, click the startup disk and create the disk. An excellent feature of Windows 98 and ME is its boot diskette. Using Windows to create a Windows 98 boot diskette gets all the needed boot files as well as CD-ROM support. To create a Windows 98 boot diskette, click Start, Settings, Control Panel, double-click the Add Remove program's icon, click the startup disk and create the disk. Note: When making a boot disk, if you are running "Stacker" or some kind of a DoubleSpace or drive swapper program, this could not work. Once you are in DOS and at the correct directory as instructed in the above sections by operating system, you are ready to create your bootable diskette. Insert a diskette that does not contain any information since it is going to be erased. If you are planning to use this diskette as a diskette to load games or you feel that you need mouse support, you need to copy the mouse driver onto the boot diskette. The MS-DOS mouse driver is mouse.com or mouse.sys. Locate this file and copy it to your bootable diskette. Press and hold Ctrl+Z to return ^Z. Once this is displayed, press Enter to copy the file. To create a boot diskette, you must have access to the i386 directory located on your Windows NT CD or possibly your hard drive. Format the floppy diskette you want to make a bootable Windows NT boot disk using the Windows NT machine. Copy boot.ini, ntdetect.com, and ntldr to the floppy diskette. If you are using any SCSI devices that you need access to, you also need to load these drivers onto the diskette. To create a Windows 2000 Professional bootable diskette, you need four 1.44 MB diskettes and the Windows 2000 Professional CD. Note: The Microsoft Windows XP CD is a bootable CD and in many cases you should not need a bootable floppy diskette. Booting from the Windows XP CD allows you to not only install or reinstall Windows XP, but also allows you to troubleshoot. When formatting a floppy diskette, users have the option of creating an MS-DOS startup disk, follow the steps below to do this. Microsoft is beginning to phase out bootable floppy diskettes in favor of bootable CD discs and has not included a method of creating a bootable floppy diskette in Windows XP or from the CD. Once the bootable diskette has been successfully created, follow the steps below to use the boot disk. Once at the A:\> take the appropriate actions depending on the situation of the computer. How to make a bootable USB drive. How to create a Windows ERD. How do I get a boot diskette? Can a NTFS partition be accessed using a bootable diskette? Unable to restore computer using restore disk. Receiving error "Missing command interpreter"
See our boot disk definition for further information and related links on this term.